Discover the vast open space of the Makgadikagadi Pans in Botswana, and experience a silence so complete that you can hear your the sound of own blood flowing. Enjoy a variety of activities from enlightening interactions with San Bushmen to delightful game viewing excursions, or even heading out on an exciting quad bike trail across the Makgadikagadi Salt Pans. The best time to visit Makgadikgadi for game viewing is from April to November when great numbers of Antelope, Wildebeest and Zebra move from the south-east pans towards the Boteti River in the west, where rain is expected to fall in November. The rainy season attracts a spectacular array of water birds and dramatic migrations of Wildebeest and Zebra. The rains usually begin in November and end in about March. The pans can retain water until April or May. The area is transformed as grasses sprout and the salt pans become a sort of algae soup. Highlights of the Makgadikgadi include a famous group of baobabs called Baines Baobabs which stand as sentinels in this flat landscape. After the rains birdlife is spectacular and flocks of flamingos in their thousands descend upon the pans. 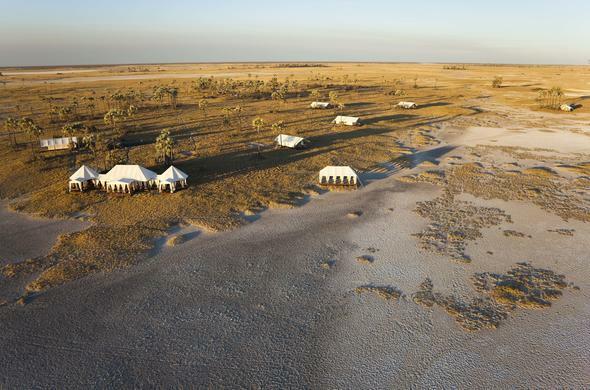 Bushmen interactions where you learn how to survive in this desolate landscape are also truly memorable experiences.The Makgadikgadi Pans are the remains of an ancient super lake, and their surface glistens with salt. 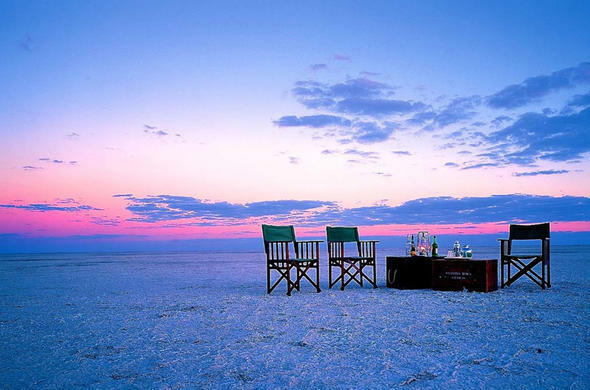 Some of the largest salt pans are found outside the Makgadikgadi Pans National Park boundaries. These include Ntwetwe and Sowa Pans. Sowa is renowned for its rainy season Flamingo population and abundance of other water birds, which can be seen from the Nata Bird Sanctuary in the north of Sowa Pan. Mystical and Serene Makgadikgadi.